We had a productive week finishing off decorating the house. The roof in the dining room was fixed so I could finally paint! I cracked on with it straight away, and come the weekend Robin and his dad were putting up the wallpaper. And what a cracking job they did of it, too. I'm in love with my new Cath Kidston chintz wallpaper! They put it up on two of the walls, and the other two walls are just white. I plan to fill that with lots of pictures and kitschy bits this summer; once the carbooting season has began. I've already picked out some curtains I want to put up from my own vintage hoarding collection. 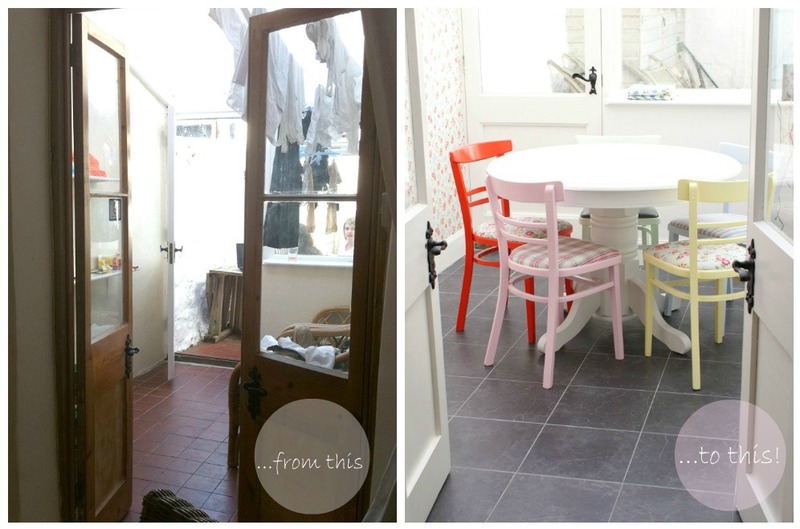 The chairs are my charity shop find last summer - for free!! I painted them up in sweet candy colours and finished them off by re-upholstering the chair pad (I just have the green one to do!). Oh my days n nights.....it's TOO pretty! I'm so in love with your wallpaper! Wow, what a transformation - I love it!! 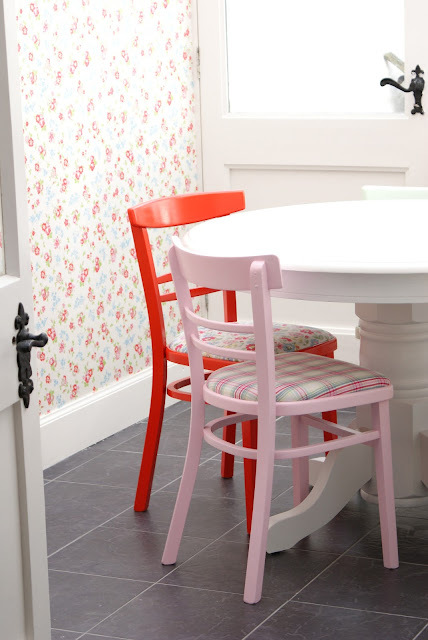 Love the wallpaper and candy coloured chairs!! It all looks fantastic! The wallpaper is gorgeous and those chairs are so sweet!!! I'll bet you are loving sitting in your beautiful new room! OMG! It looks fantastic! I love it! how lovely!! i think the wallpaper is my favorite part. so sweet!! Oh, I love it! Is that Cath Kid wallpaper? SO fun! I love the chairs! Love love love them!! Anyway, I popped over to say that I've received my fabric - there's loads of it! So excited to start making. Thank you sooo much, fab giveaway and you parcelled it up so prettily too! Big kiss. Love the coloured chairs! So fab. You've all been busy! It has turned out beautifully. Great job and hats off to all of you! What a beautiful transformation! I'm in LOVE with the chairs! more pictures, more pictures (I'm chanting). These are so beautiful. How was painting the woodwork? Seems like a total pain the rear, but the effect is so worth it! p.s. please could you turn off your word verification? It looks really really gorgeous!!! 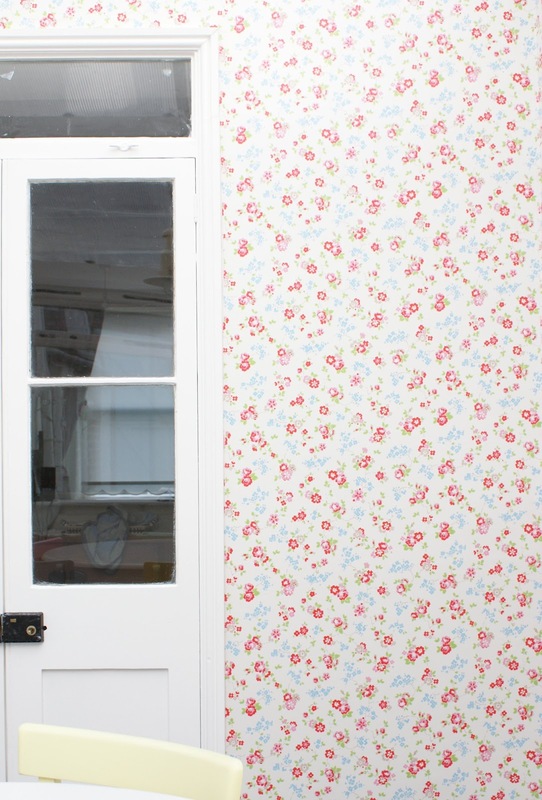 love the wallpaper and the cheerful happy atmosphere you created! The painted chairs are amazing too!!! Wow, that's seriously fabulous! I adore the different coloured chairs and the covers. Wanties!!! PS, I'm having a little giveaway over on my blog if you'd like to enter. Maybe I can return the favour by sending you some goodies! OMG! That is the cutest room. Love Cath Kidson. Beautiful! We moved into our first house almost at this time last year - unfortunately its been a year of replacing the plumbing, floorboards, some windows, etc. etc. Looking forward to the fun stuff soon!